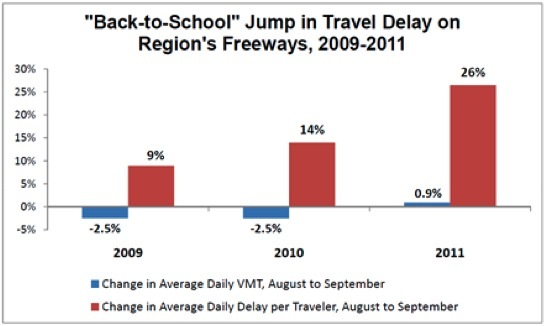 Why do traffic delays jump in September? Obviously, fewer people are on vacation. But it’s not just commuters back to the grind getting to and from work. It’s parents dropping their kids off at school, often with even less forgiving start times than an adult workday. Region Forward, a DC-based livability partnership, shows that the delay is getting worse year after year. According to the Safe Routes to School National Partnership, up to 20 or 30 percent of morning traffic can be generated by parents driving their children to school. Today, about three-quarters of school-aged kids in America get to and from school by car [PDF]. In 1969, half of all schoolkids walked or biked to school, but that rate has fallen to 13 percent, according to the SRTS Partnership. This creates a dangerous mess of cars pulling over and merging back into traffic in front of schools — with small children walking around. The result: child injuries and deaths, especially on high-traffic streets with on-street parking. A 2007 Department of Justice report [PDF] found that, to make matters worse, delayed drivers often speed when congestion eases, in order to “make up time” and out of a perverse sense of road rage. So perhaps it’s no surprise that this is a nasty week for local traffic congestion. Parents are working out the kinks in their morning routines, getting used to new commutes at the start of the school year and feeling stressed (and driving badly) when they don’t budget enough time. Part of the problem is sprawl, says the DOJ — but even kids that live within easy walking distance hitch a ride to school these days. Hoofing it is seen as “uncool” in some quarters. Maybe enough parents will get stuck in enough traffic and be late to work enough times to finally encourage kids to get to school on their own steam — and encourage schools and towns to make the necessary changes to ensure there’s a safe way for their kids to do so. That 75% can’t be true. the link says 55% are bused. I’m glad there is some data to back up my anecdotal observation that morning traffic is much worse come early September. What’s sad is that those who decide to be part of the solution – rather than the problem – by taking the bike for the morning commute instead of the car can expect to face deranged, frothing at the mouth parents behind the wheel who don’t see you as having any right to the road. The first week of back to school is always one of the worst for bike commuting for this reason IMO. @Atrios:disqus — Good catch. The DOJ report says 3/4 are driven in a car. According to the National Center for Ed. Statistics (http://nces.ed.gov/fastfacts/display.asp?id=67) the 55% figure is only public school students — though it still seems high. There may be some overlap between the 55% and the 75% — kids who sometimes take the bus and sometimes get a ride in a car. Freeing up traffic congestion is a great way to garner support for school spending on pedestrian and bike infrastructure. All those people complaining about school taxes are usually the same people complaining about traffic. Our school district won a Safe Route to School federal grant a few years ago to rebuild an unused staircase connecting a dense part of our town to the elementary school. Now more kids are walking to school, and traffic has been reduced. The project was so effective that the school district then used its own funds to rebuild another unused staircase to a trail that runs behind the Middle School. Lots of kids are using it, and they’re even putting bike channels on it. And the staircase puts kids closer to more downtown restaurants, boosting the lunch business for them. Living right across from a school in San Francisco, I can verify the utter madness of parents driving their kids to school. Not only does it cause increased traffic, but it decimates quiet neighborhoods with the completely self-absorbed parents constantly honking at each other and double-parking while dropping their kids, completely oblivious to the fact that they are in someone else’s quiet, calm neighborhood. Further, my street is a bike thoroughfare, so it’s doubly-dangerous for cyclists who have to “run the gauntlet” down the street. Especially in a city like San Francisco, I think we need to ban kids being driven to school, exceptions only being made for emergencies. We must start encouraging parents to send their kids to school via walking, cycling or the bus (and of course make our streets safer to do this … and ironically, more parents driving their kids to school because supposedly it’s not safe makes it even less safe, so the vicious cycle continues). This decision may be reconsidered. Encouragement of public transportation for youth is the third leg of the ped/bike stool and just as necessary to reducing car traffic around schools. Locally, it’s also proven to be a dynamite organizing tool and a great way to bring these issues to the attention of the general public. I’ve noticed a HUGE increase in the number of school buses in NYC over the last decade. This makes no sense from any standpoint because we pretty much have the same number of schools as we’ve always had. Nearly every neighborhood has an elementary and secondary school within a reasonable walking distance (say 20 blocks). Are lots of children being bused to schools outside their neighborhoods? If so, why? All these buses are adding unnecessary pollution and congestion for no good reason I can see. @jd_x:disqus Why must our first impulse be to ban something? There was no way that my mother could have gotten all of us off to school in the morning on time in time to walk(we lived 7 blocks from the school). I did walk home though. I expect it’s the same with the families who drop off the schoolchildren on your block. I do think that the schools should work with the parents to reduce the impact on the neighborhood; sending flyers/emails about being respectful of neighbors; reminding parents not to double park, honk; encouraging carpooling, etc. @pchazzz:disqus Generally there is only talk of banning things when people refuse to self-regulate and also to use common sense. Some parents drive their children to a school which is only a few blocks away, even in places where it’s perfectly safe to walk. Even if your case, how much time was really saved being driven 7 blocks on congested local roads as opposed to walking? I venture to guess if most parents did the math, they would find driving their children saved a minimal amount of time, or perhaps even took longer, than walking. And the more parents who drive their children, the worse it gets for everyone. I understand if some children live a mile or two from school and don’t have a safe route to bike there. For that minority it makes sense to be driven. However, in most urban areas there are schools within walking and certainly biking distance. The sheer numbers of parents who drive their children to school just doesn’t mesh with this reality. We complain of childhood obesity, and yet we do everything to discourage physical activity. Walking or biking to school is one way to ensure children get at least a minimal amount of exercise each day. This also encourages independence at an earlier age. It’s up to the municipalities to make sure it’s safe, even if it comes to banning cars or car parking within a certain distance of schools. When one person does something, it’s never a big deal. When everyone starts doing it, then it often becomes a problem which must be regulated. I submit we’ve long passed that point when it comes to children getting to school via motorized transportation, both car and bus. The vicious cycle jd_x speaks of can just as easily be reversed with sane public policy. @8273895862f4828764c2a8d05a9b4e2d:disqus Yes, it’s a shame there aren’t more school buses in SF. However, I would love to see the statistics for the school across from my house regarding how far the kids live. I wonder how many are truly out of walking or cycling distance. I bet a lot of kids are being driven who could walk or cycle, and so adding buses isn’t even necessary for these. @pchazzz:disqus Who said banning cars was my first impulse? My first impulse is what I’m already doing: writing a letter to the school to see if they can work this out without further problems (FYI, neighbors on another street also complained to the school a couple years ago … it’s a continual problem). If not, the next step is starting a petition in the neighborhood to have the school *at least* enforce a no-honking rule. Honestly, though I think it’s ridiculous how many parents drive their kids to school in such a walkable city as SF, I wouldn’t even be at this point if the parents exercised basic human empathy and considered the neighbors by not honking, being aware of cyclists, and not double-parking for more than a split second (yes, I’d even be willing to tolerate brief moments of double-parking if done with the understanding that it is being allowed provided they show good etiquette for others). In the end, as @2555783a6f62598b6aadd2d882a4830f:disqus points out, people should always be given the chance to self-regulate. And if that doesn’t work, as appears to be the case with my neighborhood’s school, then we have to resort to the next step of more extreme measures that involve government. But I agree that it should never be the first impulse. Unfortunately, in our self-centered society, it often ends up coming to such extreme measures since the casual appeals to people’s respect for others often fails. And another thing you are not considering @jd_x:disqus: because of the school district’s policy of balancing schools ethnically and racially, students may attend school far from their homes. Even in a walkable city like San Francisco, a walk from the Bayview to Glen Park is a bit far. @pchazzz:disqus It only takes about 7 minutes to walk 7 blocks at average walking speeds so I’m not seeing how driving could have saved 15-20 minutes. At most driving would save 7 minutes, assuming it took zero time. I’m figuring a minute to get in the car and buckle up, another minute to do the reverse at the destination, and maybe 2 minutes in transit (assuming typical urban average speeds of 10 to 15 mph). So that’s 4 minutes by car, 7 minutes walking, 3 minutes time saved by driving. Maybe I’m missing something here? I know my mom had no trouble getting me and my 2 siblings out the door in plenty of time to walk to school, and none of us were easy to get out of bed. Incidentally, I’m not talking about checking people’s IDs to see if they’re dropping off kids. I’m just talking about banning private cars and private car parking/standing within a several block radius of the school during times when students are going to school. That’s very easy for the authorities to enforce. It would discourage most of the people who live fairly close to school from driving their children. I find it amazing that for decades most children walked to school. Suddenly, in the last decade, it seems like hardly any do. There could be many reasons for this. I probably put helicopter parenting at the top of the list. Lenore Skenazy has it right. Let children figure out how to get around on their own from an early age or you’ll have parents chauffeuring their 20-somethings to job interviews. It’s not just about traffic and congestion here. It’s about learning to be independent. Getting around on your own is a primary step towards becoming an independent adult, arguably the most important step. I started traveling alone on the subway at 13. Same for just about all my friends. We all walked to school, or took the subway if the school was too far to walk to. I’m not seeing any good reason most children today can’t do the same. If anything, there is less crime now than in the 1970s when I was in school. @pchazzz:disqus 15-20 minutes is enough time to walk about one mile. Which must be in the ballpark of seven blocks(if not well over) unless they are more than a quarter mile each in length. So unless you are assuming driving takes no time at all I think you are over estimating how long walking takes compared to driving. I think some fellow commentators are missing a key piece of information: schools are not like pharmacies, a chain fast food store or gas stations – in that you often go to the nearest one. There is a national, and growing, trend of providing parents and children which various schemes of school choice, in which children are not anymore condemned to attend only the school closest to their residence. Notice I’m not talking about compulsory busing or the likes, but programs that let some or all children to enroll in school choice programs and attend school elsewhere other than close to home. From an educational standpoint I actually support school choice a lot. That will incidentally generate more demand for transport, but so be it, let the traffic engineers deal with that. We should suggest curbing school choice because of traffic. Unless you want to embark in some sort of totalitarian adventure like “7.45-8.10 is a city-wide traffic free period”, which is politically untenable (and for good reason! ), there is no way to implement such policy. @andrelot:disqus I’m not seeing that school choice is a panacea here. Besides the side effect of creating of lot of unnecessary traffic, there’s no body of evidence showing that it makes things better overall. You’re just shuffling cards around. The better students tend to flock to so-called “magnet” schools. Those schools end up doing better, which in turn attracts more students to them. Meanwhile, poorly performing schools lose students and money, and perform even worse. The average probably stays the same. School choice only makes sense in high school and beyond where students will begin to specialize. Below that, it makes sense to go to local schools and get a good general education. If those schools fail to perform, there is a local vested interest in getting them to improve. With school choice, these schools just end up being abandoned. Hopefully school choice, like small class size, is just a passing fad which will end up being abandoned when we realize it just doesn’t work. Arguably the best education systems are in Asia. There is no school choice at the lower levels, and class sizes are frequently 50 or more. Maybe we should emulate what they do instead of reinventing the wheel. Or just emulate what we did right here in the US in the 1940s through 1960s when public schools worked well. It seems educators for the last 40 years have been using our school children as guinea pigs trying to push all sorts of hare-brained theories and to justify hiring ever larger ranks of educators. Meanwhile, our average educational levels have fallen to that of some third world nations. Let’s go back to what’s known to work. @pchazzz:disqus Oh brother. Driving to save 15 minutes in the morning is just stupid. I was a kid too, I remember how awful it was getting up for school, but frankly, 15 minutes one way or the other doesn’t make much difference. Another two hours of sleep, now that might actually help. In other words: lamest excuse ever. Maybe there are people that really do need to drive their kids to school, but your family wasn’t amongst them. Oh, one more reason why school choice is a bad idea. Municipal budgets are tight and getting tighter. It makes no sense at all to waste money transporting children who have a local school they can walk to. Use the money spent on busing to fix what’s broken at the local school instead. Yet another unintended side effect of all this busing is increased air pollution levels which undoubtedly affect the health and cognitive abilities of children. Just physically sitting on a bus breathing in noxious fumes each day will certainly have negative effects which may well outweigh any advantages provided by a better school. @pchazzz SEVEN BLOCKS? WTF. At risk of the cliche, I was 2 miles from school and walked myself there starting in Kindergarden. 3 years later my sister joined me, then my other sister. Not only did this save my parents time, it kept all three of us away from the childhood diabetes fairy. I take it these were seven blocks of red hot coal and sharp steel spikes? While school choice might be up for debate (I’ll not go into it because it’s way beyond scope of this article), the idea that school choice is bad because it generates more traffic is absurd. It would be like saying it is bad that people these days often go shopping across state lines or that people date potential partners that live 2h away. I think school policies should be decided regardless of transportation. Personally I do like school choice and I see as unacceptable that the best student among the poorest households should bear the burnt of a lower performing school because their district is underfunded or their co-students mostly gang-members. But in any case, if having parents drive kids is the price the parents have to pay to enroll their children in better schools, and if they are willing to put up with traffic and costs, so let the parents do that (it will be much cheaper than paying private school). @andrelot:disqus Actually school choice has a lot to do with this article as it seems to be a primary generator of the massive traffic increase when the school year starts. Note the increase in congestion in a period of only 2 years. Also, remember that we don’t live in a vacuum. It’s not just the parents of the children who travel to far away schools who pay the costs here. It’s everyone. Adding unnecessary traffic increases the delays for those who may have no choice but to drive. It also increases the already bad air quality, and probably also increases the accident rate. The comparison with shopping or dating out of the local area is comparing apples to oranges. In both cases you might be talking about taking one or two trips per week at best, and often during non-peak times. Trips to school are usually taken at least 10 times per week, and usually at peak times. This represents a major cost to society in terms of lost productivity due to these extra trips. I submit that regardless of whether the idea of school choice has any merit (and that debate is certainly beyond the scope of what we’re discussing here), the idea should be discarded because of the severe costs and severe unintended consequences. Remember that these are costs which are paid by society one way or another. I suggest that if lack of funding is a cause of poor performance (and that’s open to debate but I’ll grant that point here), then we’re better off spending the money to fix the underperforming schools instead of using it outside the classroom in the form of busing. Congestion and pollution are major urban problems. Any public policy which significantly adds to them should be discarded. I wouldn’t be surprised if busing companies played a major role in the school choice movement. One thing I frequently see missing in the entire debate about school choice is whether or not the children have any say in it. I’ll bet good money the vast majority of children, particularly in the lower grade levels, would prefer not to sit in a bus or car in heavy traffic for long periods ten times per week if they have a neighborhood school a few blocks away. I know back when I started school, there was talk of busing to achieve integration (this was in the late 1960s). Basically, students would be shuffled around to satisfy some bean counter. I also remember telling my mother I would not go to school if I had to be bused. She felt the same way, and said so at a protest meeting. Eventually, thanks to similar protests, the idea was shelved. I can’t believe parents are now willingly forcing their grade school children to go to schools outside their neighborhood. It was a bad idea then, it’s a bad idea now. Like I said, if the local school is broke, fix it. School choice only makes sense at the high school level when students start to choose different career paths. @murphstahoe:disqus @PC:discus It wasn’t about the distance, it was about the time. I was a little kid with short legs who didn’t walk fast; in fact, I still don’t, my natural pace is a slow amble. The ten or fifteen minutes we saved by having Mom drop us off made the difference between being on time and being late for class. Really, I don’t see what gives you, Miles Bader and others the right to judge people. Critical intelligence and the First Amendment, in that order. I respect your right to voice your opinion, @disqus:PC; it’s your willingness to impose it on other people that I take issue with. I’m afraid I don’t quite follow you, pchazz. In what earthly sense have I displayed any “willingness to impose [my opinion] on other people” other than by voicing it in the same public forum where you voiced yours? Your joking dismissal of childhood seven-block walk as an insufficient reason for my mom to drive us to school (“red hot coals and sharp steel spikes”). You don’t know what my situation was so you are in no position to opine on it with any authority. I see that too much among advocates for bicycling, etc. They are too interested in telling other people what to do. About time cycling becomes mandatory part of NYC curriculum. @twitter-14678929:disqus Yep, you got it: Chattanooga. Ah. So making a wisecrack about an arduous seven-block walk to school constitutes “imposing” my opinions on others. Well, I’m glad we cleared that up! P.S. It’s nothing personal, but I’m afraid I’m going to have to pull on my Jackboots of Intellectual Thuggery again and ask whether it really would have killed you to leave the house ten minutes earlier? I mean, did your alarm clock run at a “slow amble” too? My son son bicycled to high school. They let him park in the “teacher’s bike parking room”, even gave him a key. The room was formerly a toilet, with still functioning parts ;-). The only crash he had was caused by one of the helicopter mothers right in front of the school – she cut in front of my son and her kid whipped open the car door to go airborne. My son crashed right into the door. The dear mom yelled at my son for being on a bike and took off. Not quite enough damage to sue them. That, pchazzz, is what’s wrong with being driven directly to school. Every damned car that in a big hurry – the kids are late, the mother is late for work, whatever, is a deadly hazard to everyone else, even the kids who just got out of another car. The danger from big dark SUVs crowding a few feet of curb is so high that there better be a damned good reason that car is needed, like a leg in a cast, not just some lame excuse about not being able to walk a few blocks. Every mother’s car is imposing a direct risk and hazard to every other kid around that school. That’s the imposition – threatening children with death, not the threat that you may have to get a bit more exercise than you would like. Drop off areas should be moved well away from the school’s front doors and away from crosswalks and bike routes to the school. Put the Motor Pool chaos well away from the school building if we can’t ban it entirely. Back to traffic school too. 😉 Because of all the violations that high school students create. School choice, combined with constitutionally-required integration, on the contrary, is a very good idea. If a kid wants to be a cabinet maker, a carpenter or a jeweler, and the program of his/her choice is at a school across town, rather than at the neighborhood school, s/he should be able to go to the school across town that has the program(s) that s/he is interested in and wants to pursue. When my siblings and I were growing up, throughout the 1950’s-1970’s, we’d all take the bus to school. We’d go down to the bus stop at the other end of our street and wait for the school bus in the morning, along with all the other kids. Although my younger brother and sister both went to private schools from the 8th through the 12th grades, I stuck it out in the public schools. Do you want to UPGRADE your TRANSCRIPT and get your desired certificate.